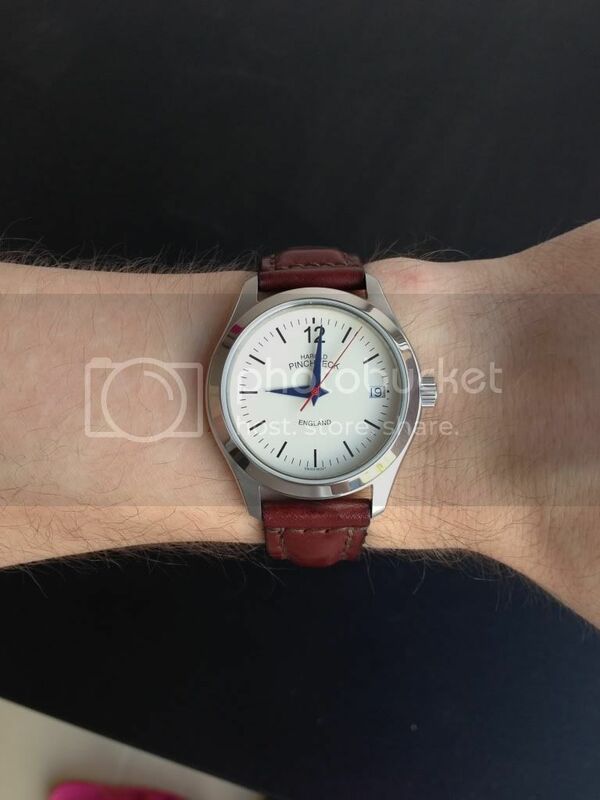 As some of you already know I stumbled upon the H. Pinchbeck brand on the web, and decided to buy there watch model called ‘Edward’ watch on the basis I liked the minimalist classical styling it was made in England (albeit with a swiss movement) but the main reason was the model name ‘Edward’ is the name of my 8 month old son. As there seems to not be a lot of info on the web about these watches I said I would try and write a review once I received it. Well its taken me longer than I anticipated to find time to sit down to review my Harold Pinchbeck Edward watch, but its also given me more time to live with it so hopefully the review will be all the better for it. I should state at this moment that this will be my first ever watch review (actually first review of anything!). So here goes….. Right from the start I was amazed with the level of customer service offered from Harold Pinchbeck. I started proceedings by emailing a short message asking for a bit of information regarding the differences between models, I had a response the next day with my answers and suggesting that if I wished to place an order to telephone and discuss my requirements various options can be chosen/changes should I so wish. The email was signed Paul Pinchbeck! A couple of telephone conversations with Paul followed and resulted in me placing my order with a few revisions and also including a £25 discount for signing up to a newsletter. The case of the Edward is quite small compared to most modern offerings, but I find it a perfect size for a watch to tuck under a shirt sleeve. 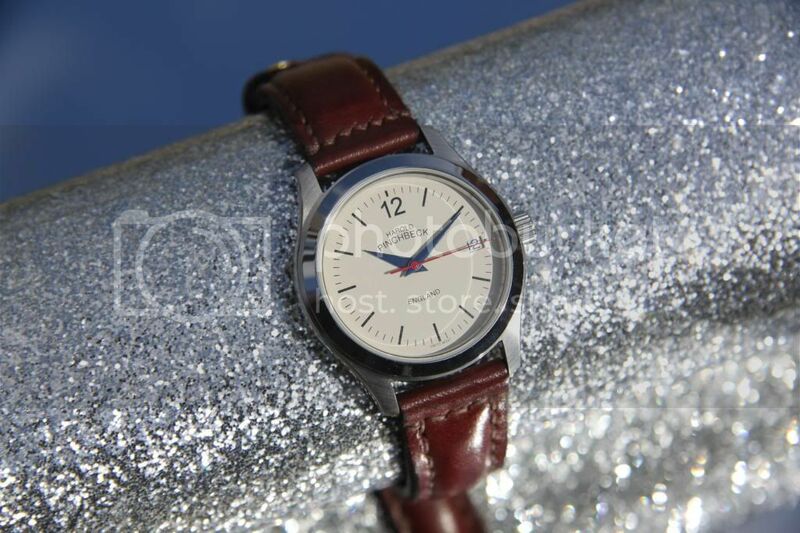 It has a polished stainless steel case with a very simple yet stylish design. The case measures 36mm dia. w/out crown, 40mm lug to lug and is 10.5mm thick. There's no crown guards & the case back is a screw on with deep engraving H.PINCHBECK. If I was to be critical my personal thoughts are that I would like to have had a bit of depth to the dial, something as simple as applied hour markers and a surround to the date window would just lift it subtly. Also I wish the date background colour would have matched the dial colour, instead it is just standard white. I chose to have Blue hour and minute hands with a red second hand, as I wanted to add a bit of colour to the watch, I think the combination works excellently. I chose the hand made Tanner Bates Leather strap (again made in England) and also ordered an additional ostrich strap to go with the watch. It came with the Tanners Bates strap attached and I think this is the best leather strap I have ever seen, I can’t describe how amazingly comfortable and supple it is. Straight out of box the smell of leather was the first thing I noticed, then unlike any other leather strap I have had it was soft and flexible right from the start surprising as it’s about 4mm thick, it matches the watch beautifully and is very comfortable, I don’t think the ostrich strap will see the light of day! Again being critical one thing I think is missing is the buckle is plain, it would have been nice to have a logo etched on there. On the wrist, there’s no denying this is a small watch against most others these days but as a dress watch I think it’s perfect size to fit under the cuffs of shirts. The box and packaging I think is often overlooked in watch reviews but I think this plays a massive part in your perception of your new purchase, The ‘Edward’ comes in a fantastic long wooden box, wrapped in tissue paper and inside a white card outer, from the first moment you remove it from the standard brown protective postal packaging you know you have something special! This watch looks amazing, feels amazing and has the added advantage of the fact I’m unlikely to bump into any one else with one, and it feels nice to own a watch that I specified how I wanted it to look, albeit it was from a standard list of options, also I can say it’s hand made in England. I’ve seen a lot of comments mentioning that Harold Pinchbeck watches are expensive compared to the likes of Christopher Ward watches and specification wise on paper they probably are, but on Paper you wouldn’t buy most top end branded watches that are mass produced in there 10,000’s – I buy watches because I like the style and the quality and then decide if it’s worth it to me, not by how cheap I think it is compared to a similar model from another brand - in reality H. Pinchbeck watches are hand made in very small numbers using quality swiss movements this has to be paid for. 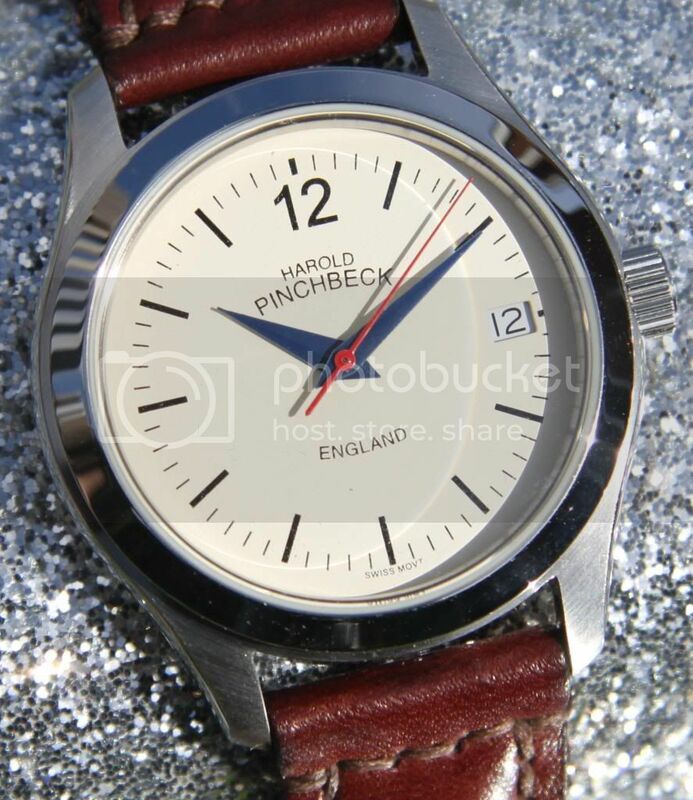 I cannot fault the whole experience of purchasing a watch from Harold Pinchbeck, from my telephone conversations with Paul Pinchbeck to email updates on when my watch would be ready, even down to the email after I had received my watch to check all was OK and to see if I needed anything further. Now the bit to confuse you all… I love this watch and it’s a keeper that I will never consider selling, and if you’ve got a budget of £500 to spend and want something different in your collection I would definitely recommend buying it…. but taking away my emotional attachment to this specific model, I would probably not have purchased it due to two things firstly it’s only got a mineral glass, secondly it a quartz! BUT both of these are easily resolved by purchasing the next model up ‘The George’ this has an automatic movement & sapphire glass, although this costs £999 I would have no problem with this based on the small numbers these watches are made in. Also worth mentioning they offer a 90 day money back guarantee if you don’t like your watch once received. Very nice. I've mentioned before that the "George" is on my potentials list, and I think they're nice people to deal with. I'm not sure they win on "value for money", but I like the watches anyway and may well indulge when my finances are healthier! Nice watch, not my kind of design but can appreciate the custom offerings etc..
Have to say i would be very disappointed to pay that money and not have a sapphire crystal though. Very good review. Although I would not buy that particular watch (too small), I can appreciate the workmanship and actually, I think the value for money is not too bad at all. My view is that it is a nice looking watch that you like and that is all that matters. Thank you for the review. Well done! Great first review goose. It's great to see you going for this watch and loving it when it turned up, good for you! Great review, nice reading thank you. I've been interested in Harold Pinchbeck for a while, thank for the info. A lovely looking watch, and superb packaging! Also a really great review, thank you! 10.5mm strikes me as a little chunky for a quartz but I assume that, as with the C5, the same case if used for the automatic. VFM...how long is a piece of string? In the end it's about personal satisfaction and overall you sound very satisfied. I'll wait until they produce a manual wind...if they do that, I'll be VERY interested. Nice review. Lugs appear a bit big on the wrist shot but otherwise a very nice looking watch. As for it being quartz, it really does depend on what you want it for. 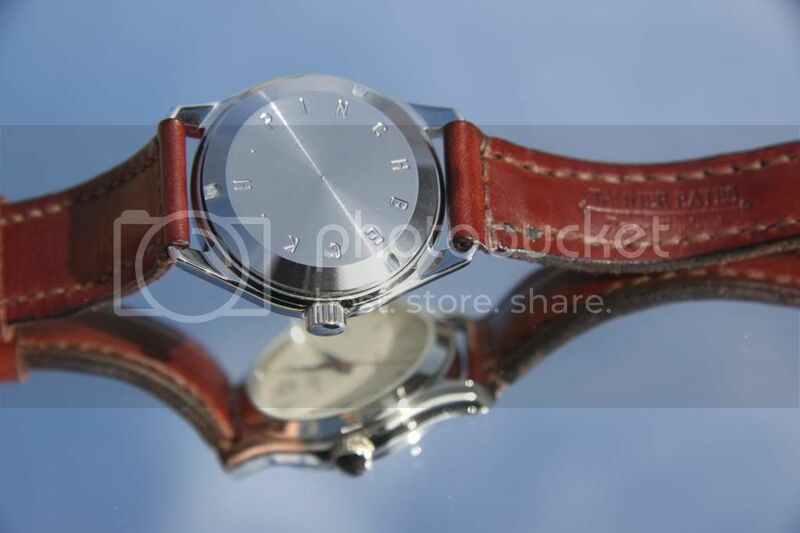 There are plenty of generic quartz watches that sell for a lot more than £4-500. Wear it and enjoy, lovely looking watch you have there. Wouldn't mind a look at the automatic. 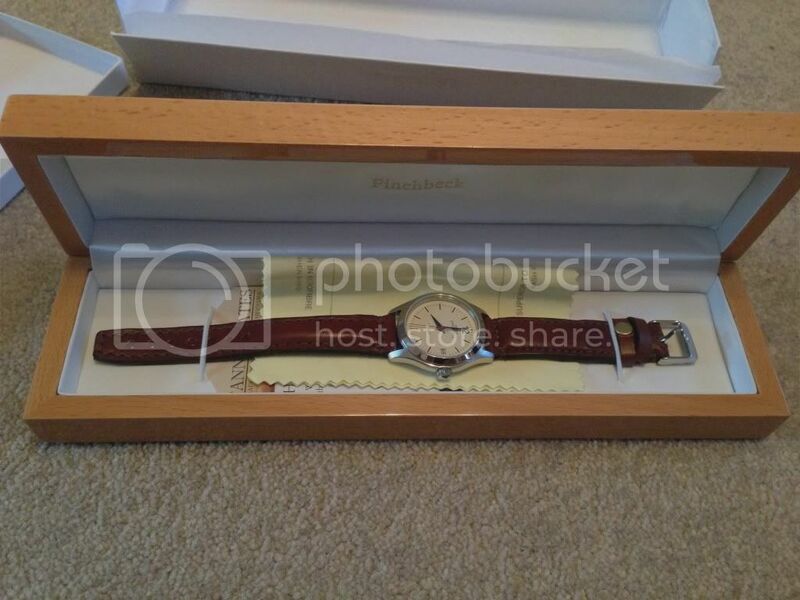 I am a bit dissapointed with Harold Pinchbeck, I wanted to treat myself to a new watch and was interested in a George. I requested a brochure about six weeks ago and never received one, then I emailed them on Saturday asking for some info and never had a reply. 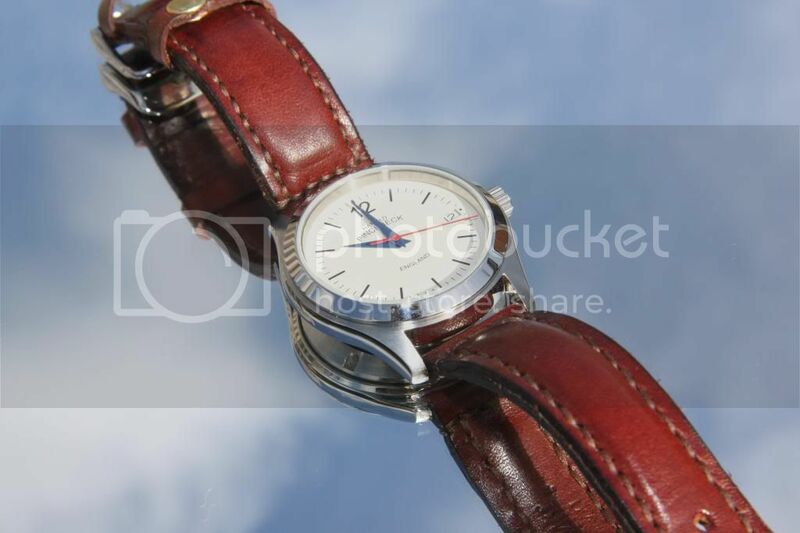 I am now waiting for some info from Nomos and they can have my money instead. No wonder the British watch industry is virtually none existent. douglasco wrote: I am a bit dissapointed with Harold Pinchbeck, I wanted to treat myself to a new watch and was interested in a George. I requested a brochure about six weeks ago and never received one, then I emailed them on Saturday asking for some info and never had a reply. Nice way to introduce yourself. Welcome. For me it highlights how reasonable it is for CW. At that price point I would want an automatic and sapphire glass. This sums up my thoughts too. 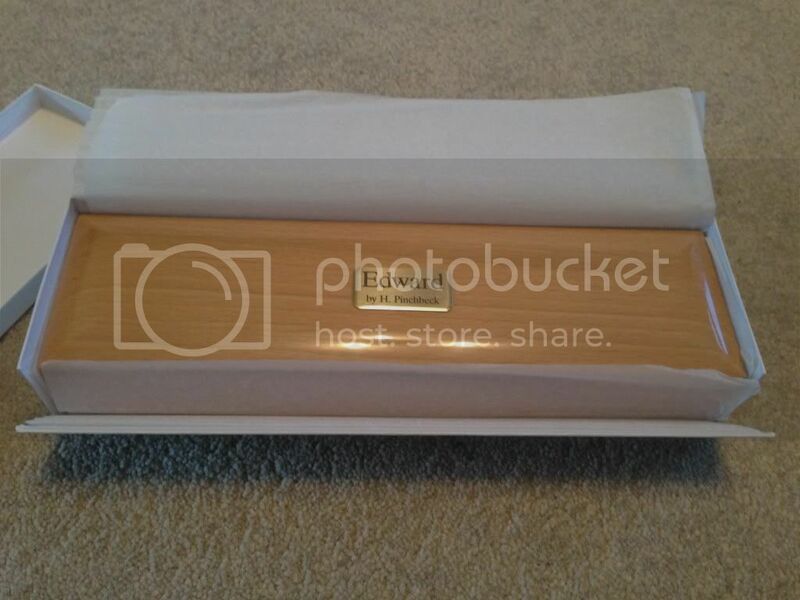 Nice review, thanks for the effort and insight! Enjoyed reading your review, thanks. The George as you say is an interesting proposition with it's automatic movement and sapphire crystal. Those Tanner Bates straps retail at £105, so that's where some of your money goes, and it sounds like it's worth it to get that nice comfortable feel.